Well Wikipedia is usually used for "research"....not always the best place for research either considering the fact that anyone can edit it and "change the facts," but hey, I use it myself and have no real issue with it. What I didn't realize was just how many unusual articles Wikipedia covers. In fact, there's a whole article just for the unusual articles! You're gonna have to check these out. Wait a minute. I just noticed that every paragraph written so far has started with a 'w'. Breaking the trend. So the picture up top? 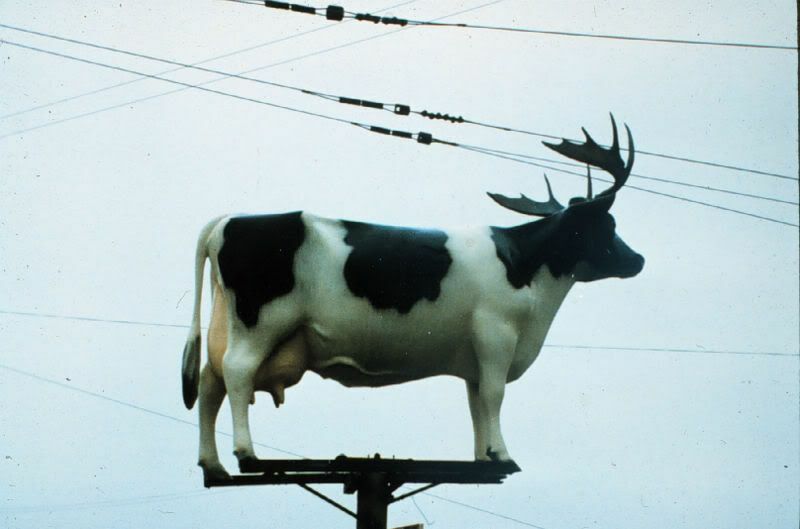 It's "a cow on a pole with horns." I think you could notice that yourself, huh? Well it's one of many interesting items on the page. There's also talk of safety coffins, toilet related incidents, crushing by elephant, chess related deaths, United States military chocolate, Emu war, you have two cows, acoustic kitty, man-eating tree, machine elf, flying ointment, gef the talking mongoose, flugtag, dwarf tossing, conger cuddling, stinky tofu, fried spider, chubby bunny, spaghetti trees, jumping the shark, goofy holler, boys are stupid/throw rocks at them, any key, one red paperclip, human mail, wrap rage, guided rat, bloop, extreme ironing, behind the sofa, calculator spelling....and about 100 times more equally odd-sounding subjects.